Foot pain & swelling is a symptom, not a condition. There are many conditions that may cause these symptoms and the appropriate treatment depends on the cause. But, according to the Podiatry Institute, poor circulation is one of the most common causes. Poor circulation is something of a “catch-all” phrase that doctors use to refer to reduced circulation of bodily fluids, resulting in edema. 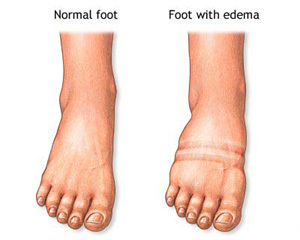 Edema is another word for swelling. It occurs when fluids (plasma, water, etc) accumulate in the spaces between the cells of the body. The causes range from something as minor as spending too much time in one position, such as sitting for hours on an airplane, to something as serious as heart disease. A number of factors can contribute, such as eating too much salt or simple carbs, like white bread. Pregnancy and PMS are among the common causes. Foot pain & swelling are the most common symptoms, but depending on the underlying cause, there may be swelling in the hands, puffy eyes, weight gain, increased urination, headaches or heart palpitations. As mentioned above, the long-term treatment depends on the underlying cause, but the first order of business is to reduce the edema. In order to do that, the legs need to be elevated until they are above the level of the heart. Elevation takes pressure off of the heart, allowing it to circulate bodily fluids more effectively. The human body was not actually designed to stay in one position for long periods of time. Everything works best when periods of physical activity are followed by periods of rest. Office jobs, driving, standing at a counter for hours on end, flying and many other modern jobs and activities decrease the hearts ability to circulate fluids effectively. Taking a break from your sedentary job to walk around during the middle of the day or at least getting up to stretch every few minutes will help reduce the risk of foot pain & swelling. Most of us cannot take a siesta during the day, but in the evening, after work, take some time to put your feet up. You can also wear support socks or stockings during the day and always be sure to wear properly fitting shoes that allow extra room, especially if edema occurs on a regular basis. The Foot Smart Leg Elevator is an ideal solution for foot pain & swelling, regardless of the cause. It can be used during a 15 minute break or overnight. It puts the feet and legs in the perfect position to allow for improved circulation of fluids. Improving circulation will reduce aching or cramping in the feet, legs, calves and knees. This type of therapy is beneficial for varicose veins, as well. When foot pain & swelling occurs frequently, it should be evaluated by your doctor to rule out serious health problems. When you know that the cause is something minor, just put your feet up. It works.